Pumped Up Vanilla Peanut Butter Dip! Good morning Friday! I am so happy that I got to start today a little slower this morning. We stayed up a little later than a normal night after going to the movies with the kids. We did not end up seeing Back To The Future, due to them changing the schedule, so we saw Jurassic Park. Wow, that brought back so many memories of when Tony and I first met. Also, it totally scared the poo out of me. It's funny how much scarier it was on the big screen! The sounds actually shake you and well, the dinosaurs are HUGE! The kids loved getting treats during the movie too. We can't do that all the time, but it's fun to watch them enjoy milkshakes and popcorn while watching a movie! Tony's sister and her family will be venturing here tomorrow to pick up my nephew and hang out here for a couple of days. Today will be a scrub the house because 3 stinky boys have taken over kind of day! I have roped off the room that they have been sleeping in so no one can enter other than the boys. I grew up with 4 girls in our family and I swear, we made messes, but I don't think we created a stink like the one boys can make. Hello Fabreze! Stir it all together and enjoy! 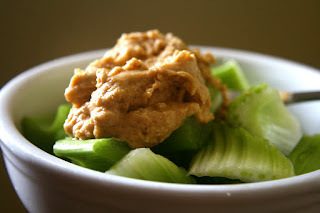 The cool crisp celery paired with the creamy slightly sweet peanut butter with a hint of vanilla...YUM! I'm craving all watery vegetables lately. I think it's due to the horrible heat and air quality! I swear, I went to the store yesterday and I had sweat dripping from my ankles! Miserable! What are the temps where you are? What foods/drinks do you crave in the heat? The dip sounds awesome---right up my alley! I agree---boys are stinky! My nephew's feet smell so bad sometimes. I just don't remember my sister and I ever having those issues! Boys are so stinky. I think they just don't care when they're dirty! Yum-- looks tasty! I love the peanut butter/vanilla combo. LOL - gotta love those scrub-because-you-have-guests cleaning days! Hope you have a nice visit. I need to try that "dip" I love PB2 with hazelnut stevia so this just takes i up a notch. can i just say that i love that you used LIFE BASICS!! p.s. i febreeze the heck out of our laundry. stinky boys! I love the idea of this dip Sarena! So creative and so delicious sounding! So many boys! I always wonder how moms with all men do it. Alisa - Yes! It is lower in fat! Honestly, I love the stuff and the one I linked to is the company that was branded as Trader Joe's when it was in their store. There are 16 grams of protein and 110 calories in a quarter of a cup. I've been on a crazy protein kick lately and this stuff is so great to have around. I think it's cheaper than PB2? Mixing it in with my chocolate protein powder makes for an amazing chocolate peanut butter pudding! I hardly ever eat regular peanut butter anymore since I really need more protein, not more fat in my diet. I rehydrate this with water or almond or coconut milk anytime I need peanut butter. I've made something similar like this, and I LOVE it! Peanut flour is also good mixed with vanilla syrup!!! I live with TWO stinky boys if you count Basil? ;) today was my bathroom cleaning and vacuum the WHOLE house day, so I know of what you speak. in the heat (we are FINALLY getting some real summer heat, like 90's WOOO) I always crave fresh and cool... salads, lots of water, fruit, veggies and smoothies. we have been eating a lot of cucumbers, carrots, and lots of fruit to help with the heat! oh my gosh, i'm dropping what i'm doing and making this NOW! yummmmmmmm! Meatless Monday! Miniature Lentil Loaves!